The story of OrangeStage or The Canopy Stage as its also called go far back. Actually all the way back to 1976, when The Rolling Stones needed a stage for their european tour. 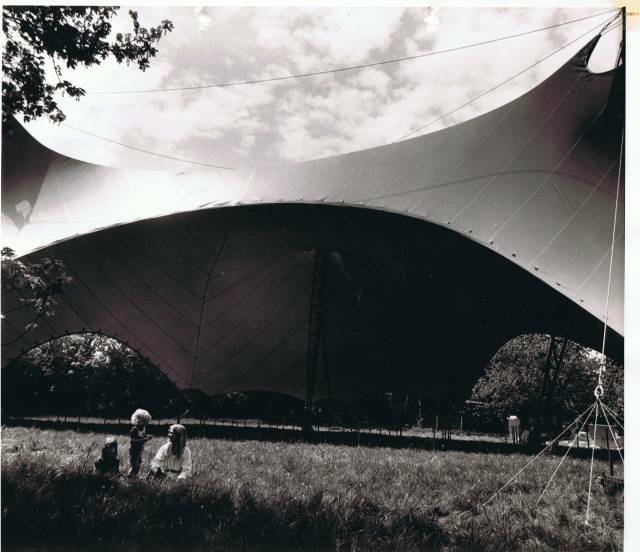 It was a man named Bill Harkin that made the design of the tent and without his knowledge created what later on would be the icon of Roskilde Festival through all theese years. And by our opinion one of the most characteristic and beautiful rock stages in the world. 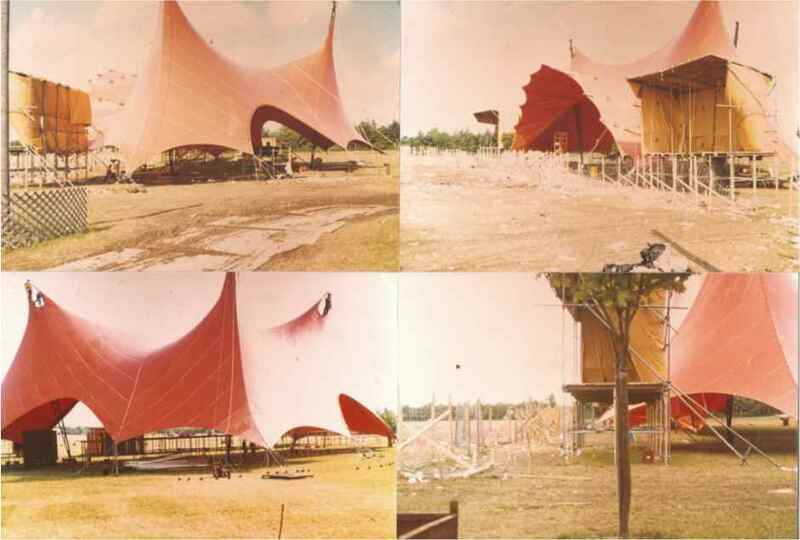 (Before and later on he designed other tents and stages, and still does today). When the drawings was complete he needed to test the design. Just as when we build our tent he chose to start with a scale model. He was building a full size rock stage so he chose a size for his scale model that is actually pretty close to the full size of our tent. This model was complete in the early spring 1976. In 1977 it was used by different artists amoung them Queen. 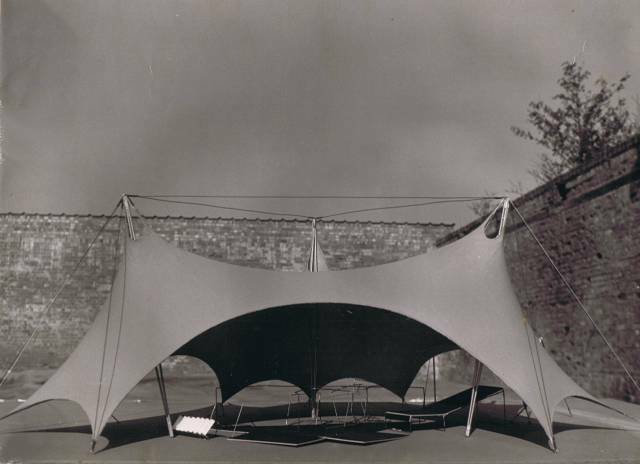 In 1978 Roskilde festival chose to buy the tent that should become Orange Stage. The festival had reached a size of almost 40.000 guests which made it necessary to buy a larger main stage. The tent was bought in England at a price of £10.000 before the the festival and became ready to present Bob Marley and other famous artists at the anual Roskilde Festival. The video and photos below is from the first erection of the tent af Roskilde Festival in the summer 1978. In 1983 the old canvas needed to be replaced. At the old canvas the front arc(not installed in black and white photo above) was supported by horizontal poles. On the new canvas it was chosen ot alter the design a bit by replacing poles with the today well known steel front arc to support the canvas forward and make it strong enough to fit a large amount of light and sound accessories. In year 2000 during the Pearl Jam concert the terrible accident where 9 young men died shocked the festival. After the festival it was decided to change all the setup on and around the Orange Stage. Amoung these changes was a total replacement of the now aging tent with a brand new and much larger tent. 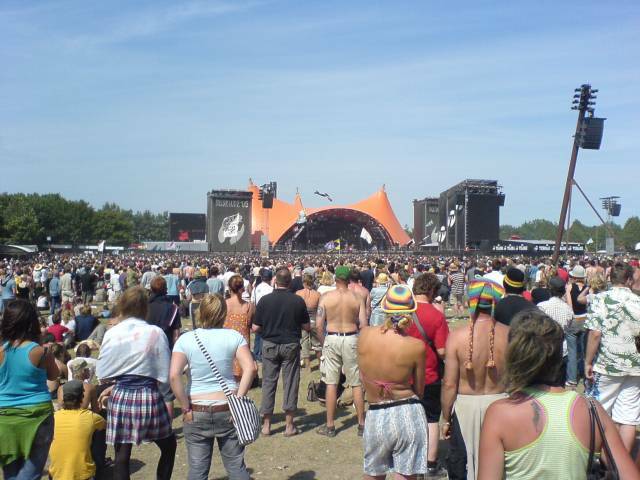 When the tent was build larger so was the front arc which resulted in as much wider main stage at RoskildeFestival.